‘There are nine instances of two casualties with the same surname. The first of these are Andrew Angus and Leslie Angus. It was their father who unveiled the war memorial when it was dedicates on 27 November 1921. In 1911 the family, including sister Rita, were living at 18 Fifth Avenue. Andrew was the eldest born in 1881. He was a sergeant serving in the 16 Battalion, Northumberland Fusiliers and was killed on 20 February 2016 when they came under heavy gunfire at Aveluy. He is buried there. Leslie was a private in the 5th Battalion (Territorial) Gloucestershire Regiment and was also killed in action. He died on 27th July 1916, age 20 and is buried at Lavente, thirty miles north of his brother. Both also appear on the War Memorial at Chillingham Road School. After a brief unsuccessful search for John Brown and John Brown Jnr as well as John and Leonard Davies I moved to Edwin and Thomas Lant. At first I could not be sure that they were related. The 1911 census lists Edwin, age 20, living with his father, John and his mother, Mary Eleanor on Jesmond Dene Road. He has three younger siblings but there is no mention of Thomas. A search of the 1901 census shows the family including Thomas living in Darlington. The father is a building contractor and possibly moved to Newcastle for work. It was Thomas who was killed first on 1 November 1916. He was second lieutenant in the Northumberland Fusiliers and is buried at Bezentin-Le-Petit Military Cemetery. He would be about 28. Edwin died on 8 September 1917 age 27. He too was a 2nd Lieutenant and was serving in the Royal Field Artillery. He is buried at Noeux-Les-Mines Communal Cemetery, about 40 miles from his brother. I turned my attention to Bertie and Chester Potter whom I originally thought would be related to the Potter family from Heaton Hall. Fortunately I discovered that Sandra MacDonald (19th Newcastle Scouts) was doing similar research and was able to pass much useful information me. Bertie Potter was the son of Fred and Annie Potter. He was born in Middleham, Yorks, the second youngest of nine children. In 1911 the family were living in Wooler but at the time of Bertie’s death his parents were living in King John Terrace, Heaton. That was on 10 August 1917 when he was 19 and serving in the Royal West Kent regiment. He is buried at Godewaersvelde British Cemetery. In 1911 Chester Arthur Potter was living with his mother Jessie and his elder brother William Stanley at 48 Coquet Terrace. He was employed as an Insurance Clerk. He was serving in the Royal Field Artillery and died of wounds on 1 April 1918 age 28. He is buried at Hannerscamps New Military Cemetery. Henry Sibbit and George Bertrand Sibbit were brothers living in 1911 at 21 Rothbury Terrace along with five younger siblings. Their father Thomas Henry Sibbit was a ‘Schoolmaster, Elem (Head)’. Their mother Jane Elizabeth Fisher Sibbit had given birth to eight children in 24 year of marriage. A daughter had died age 5. Their eldest son Henry was to become a major in the Tyneside Scottish Battalion, Northumberland Fusiliers. He was killed in action on 1 July 1916 age 27 and is remembered with honour on the Thiepval Memorial. George Bertrand Sibbit was killed in action on 27 September 1918 age 27. He was serving with the Northumberland Fusilier as a Lieutenant and is remembered on the Vis-En-Artois Memorial. Both appear on the War Memorial at Chillingham Road School. Waller is a name still connected with St Gabriel’s and Thomas William and Robert Edward were the brothers of Eileen’s father. In 1911 they were living at 114 Tosson Terrace along with their mother and father, two brothers and two sisters. Thomas William was serving as a Signaller in the Northumberland Fusiliers after spending 12 months in France he had been drafted to Italy. He was killed in action on 27 October 1918 age 21 and is buried at the Tezze British Cemetery. Robert Edward enlisted in January 1917, aged 17 years 10 months, into the West Yorkshire Regiment. He was to remain in England until March 1918 when he travelled from Folkstone to Boulogne and was transferred to the Durham Light Infantry. He died on 22 April 1918 and is remembered at the Bouzincourt Ridge Cemetery, near Albert, France. Both bothers are remembered on the Chillingham Road School WW1 Memorial. Thomas is also on the Royal Grammar School Memorial. In 1911 John Cyril Watmough and Victor Watmough were living at 41 Meldon Terrace along with their mother, Helen Mary, three brothers and two sisters. Their father, John, is not mentioned in 1911 but in 1901 he is listed with his family living in South Shields and is described a ‘Political Agent – Own account’. In 1891 he was a teacher of language and science. John served as a second lieutenant in the Northumberland Fusiliers and was killed in action on 10 July 1915 and is buried at Ridge Wood Military Cemetery, Ypres. Victor served as a Private in the Royal Scots and died on 22 October 1917. He is remembered on the Tyne Cot Memorial and also on the War Memorial at Chillingham Road School. Ernest and Norman Watson do not seem to be related. There is 1911 record of Ernest Watson living in Jesmond with his father John and mother Margaret as well as younger siblings. He was a shipbrokers clerk. He served as a private in the Northumberland Fusiliers and died on 31 August 1916 age 28. He is remembered in the London Rifle Brigade cemetery, Hainaut, Belgium. At the time of his death he was married to Gladys. My searches led me to Norman O Watson who in 1911 was living in Elswick along with two older brothers and his parents, James (an art master teaching drawing) and Isabella. Norman was a private in the Northumberland Fusiliers and died of wounds on 3 March 1916 age 19. He is remembered at the Millencourt Communal Cemetery. At the time of his death his parents were living in Newport, Monmouthshire but are recorded as ‘Native of Newcastle upon Tyne’. This entry was posted in Research and tagged Andrew Angus, Bertie Potter, Chester Potter, Chillingham Road School, churches, Coquet Terrace, Edwin Lant, Ernest Watson N, Fifth Avenue, George Bertrand Sibbit, Henry Sibbit, John Brown, John Cyril Watmough, John Davis, King John Terrace, Leonard Davies, Leslie Angus, Meldon Terrace, Norman Watson, Robert Edward Waller, St Gabriel's, Thomas Lant, Thomas William Waller, Tosson Terrace, Victor Watmough, WW1 on May 11, 2018 by oldheaton. If you were asked about Heaton’s most important exports, you might well mention great feats of engineering, such as Sir Charles Parsons’ ground-breaking steam turbines, or Grubb Parsons’ telescopes, both of which are still to be found throughout the world. Or perhaps you’d suggest music, with local boy Chas Chandler, inducted into Rock and Roll’s Hall of Fame with ‘The Animals’ in 1994 – the band’s 60s’ songs still played and performed all over the world half a century after they were written. We rightly commemorate such achievements with plaques, books and museum displays. But hands up if you’ve ever stopped on Grafton Street and given even a passing thought to the local men who married both of the great Heaton industries of engineering and music? In truth, you might never have had cause to go to Grafton Street at all: since redevelopment of the area, it’s perhaps the shortest street in Heaton (or is it Byker?) comprising little more than four parking bays (usually full) facing Shields Road and a single yellow line. There’s a pawnbroker’s shop on one corner and a council customer service centre on the other. But there’s also a nearby bench on which you can sit and listen. There may still be music in the air. Charles William Howden was born in All Saints parish, of which Heaton was a part, in 1865 and baptised in St Nicholas’s Cathedral on 28 May of that year. He was the eldest child of Ryton born, Margaret Isabella, and John Howden, a shipping clerk from Wakefield in Yorkshire. By 1881 at the age of 16 and still living with his parents and now four younger siblings in the west end of Newcastle, Charles was described as an ‘organ builder’s apprentice’. Ten years later, still living in the parental home, he is described on the census as an ’employer’ and ‘organ builder’. 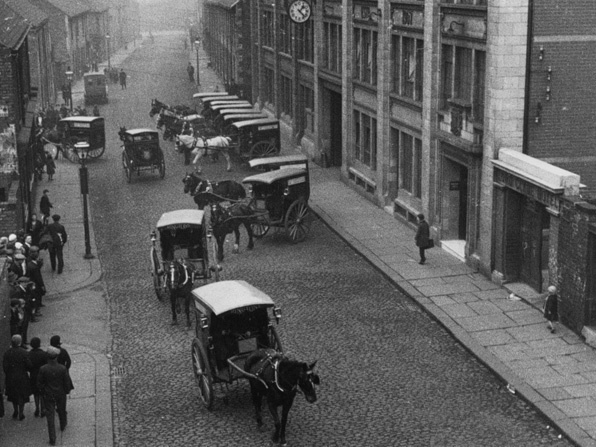 We don’t yet know to whom young Charles Howden was apprenticed but we can trace the development of the organ building firm that bears his name from its foundation c1893 via Forth Street and Snowdon Street in Newcastle to 65 Grafton Street, Heaton. Howden had joined forces with one William Charlton Blackett, the Bensham-born son of a coal agent, to set up the firm of Blackett and Howden Ltd.
Like other more famous engineers operating around Heaton at this time, Blackett and Howden weren’t content to copy what had gone before. They wanted their organs to be better than everyone else’s. We can trace several patent applications: for ‘pallets‘ (1891). ‘pneumatic action’ (1895) and ‘blowing‘ (1904). ‘It frequently happens in organ building, when the requisite conditions are fortuitously complied with, that a pallet will commence to vibrate rapidly, and it is often within the province of an organist’s or organ builder’s observation that such a “fluttering pallet,” or a Tremulant in a state of rapid vibration, when provided with a resonator in the form of a soundboard or wind trunk, generates tones of considerable power. The safety valves of steamboats constantly act similarly. … The idea must doubtless have occurred to many builders … that such phenomena might systematically be adapted to tonal use. Whether because they were louder or simply because they were of superb quality, Blackett and Howden organs were sold not only across the north east but soon throughout the UK and even overseas. Some of the earliest church organs for which records exist are in Scotland; the one in the Braid Church in Edinburgh was built in 1898 and there were other early instruments in Glasgow, West Kilbride and Montrose. At one point the firm did so much business in Scotland that it ran a second workshop in Glasgow. Another one followed in Cardiff. According to the British Pipe Organ Register, locally, the firm built the organ for St Gabriel’s (date unknown), Heaton Methodist Church (1910) and Heaton Congregational Church (1920). 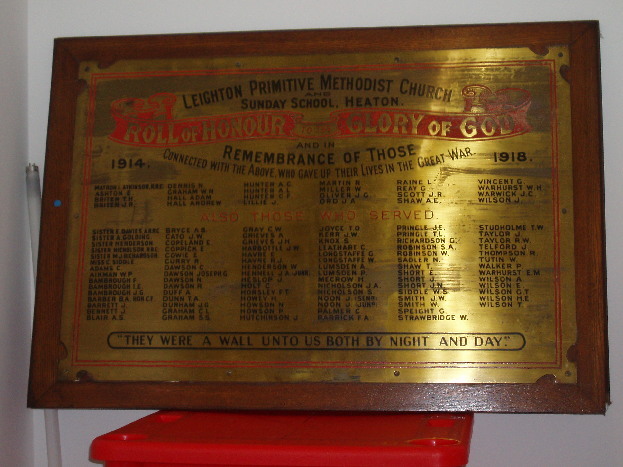 The transport costs to Heaton Congregational Church must have been among the lowest for any Blackett and Howden organ: the church (now Heaton Bingo) was only a few hundred yards from the factory. Unfortunately, we don’t know what happened to this organ: it doesn’t appear on the current National Pipe Organ Register. There is some confusion regarding the St Gabriel’s organ. According to the British Pipe Organ Register, organ N04082 was surveyed in St Gabriel’s in 1944 and described as ‘built by Blackett and Howden (date unknown)’. According to the opening sentence of a report written in 1994 by Paul Ritchie: ‘The builders of St Gabriel’s organ would appear to be modest as there is no name plate on the console, nor do the bellow weights carry their initial letters’. Ritchie goes on to say: ‘Somewhere in the back of my memory is a little voice saying Abbott and Smith’. And indeed there is another entry in the register for St Gabriel’s: organ N12464 ‘built by Abbott and Smith in 1905; surveyed in 1980′. Another unsigned and undated report states that Blackett and Howden installed an exhaust-pneumatic action around 1920 and that, at the same time, tuba and pedal trombone were added ‘and the Great Organ gained a large Open Diapason with leathered upper lips. This latter stop was placed on a separate unit chest and was reported to be rather poor; it was removed by Willis in 1963′. But there are no such doubts about the instrument in Heaton Methodist Church. It was inaugurated on Wednesday 4 May 1910: ‘there were recitals from 2.30pm, followed by a public tea. Special services took place on the next three Sundays and a concert took place on Monday 23rd May.’ And it’s is still going strong. A celebratory concert was held in 2010 to celebrate the centenary of its installation and the programme included a short history of both the organ and of Blackett and Howden itself. But perhaps the most famous Blackett and Howden organ still played today is in the Royal Memorial Chapel of the Royal Military Academy Sandhurst, which was built in 1924. The instrument is described in the history of the organ as ‘for its time, fairly cutting edge technology’ with ‘pioneering use of tubular pneumatic action’. After the war, the architect Sir Hugh Casson designed a new organ case for the instrument above the chapel’s main war memorial. At this point the organ was rebuilt and enlarged but using a lot of the original pipework. Sadly many Blackett and Howden organs have been destroyed over the years but that originally built for the Prince’s Theatre in North Shields was fortuitously rescued by an Australian enthusiast. Apparently this was the only unit theatre organ ever built by the firm (in 1929) and its console was displayed at the North East Trade Fair Exhibition. According to locals, the Prince’s Theatre organ had ‘a beautiful tone with sweet voicing and ample power for the large house.’ Although its console was destroyed in 1969, its chamber contents were bought for £75 by the Organ Society of Australia. They even obtained the original receipt! We have found a record showing that, on 16 January 1917, William Blackett sailed from London to Hong Kong on the Japanese ship, SS Fushimi Maru. It was a dangerous time to be at sea: over 200 allied ships were lost during January 1917 alone. But it shows that Blackett and Howden’s reputation was worldwide. As you can see below, most of Blackett’s fellow British passengers were missionaries or nurses. The organ of St John’s Cathedral in Hong Kong was built by William Blackett ‘an elderly, bearded gentleman’ who ‘had come to the colony to install one of their organs in a church in the colony. Finding the climate congenial, he decided to stay and set up a small organ factory in the city. He recruited a group of Chinese and taught them the trade’. Full renewal of the existing organ was priced at $14,000 but fundraising was suspended because of what was called ‘troublous times’ in 1925: a strike and anti-British boycott ignited by a deadly shooting during a strike in Shanghai, fuelled to fever pitch by British and French guards killing demonstrators in Canton. Nevetheless the organ was complete by 1927 and services, in which the organ could be heard, broadcast on the radio the same year. Meanwhile back home, Blackett and Howden was sold to the London firm of Hill, Norman and Beard in 1924. At this time, John Christie of Glyndebourne became the major shareholder and Charles Howden became general manager with Ralph Walton Blackett, William’s son, sub-manager. But on 25 September 1927, with William Blackett still in Hong Kong, Charles Howden died at the age of 62 at his home, 35 Rothbury Terrace. He left £1873 3s 3d in his will, a modest sum considering the success of the company he had co-founded more than thirty years earlier. Blackett and Howden’s name continued to be used, however. It traded from its Grafton Street premises for another half century. The Heaton factory finally closed in 1974, when the remaining part of the business was purchased by N Church & Co.
William Blackett and Charles Howden did not, of course, build their organs alone. Hopefully this article will enable us to trace people employed in the factory in later years. In the meantime, it seems appropriate to pay tribute here to some of the workers listed in the 1911 census whose reputation and, in some cases, expertly crafted musical instruments live on more than a hundred years after they were made. One of these was Terrot G Myles who, in 1911, was 30 years old. He lived at 149 Molyneux Street. Terrot is described in the census as an ‘organ builder‘. Thanks to his granddaughter, Grace, we have photographs of him and know quite a lot about his life. Terrot was born in Glasgow but moved to Edinburgh as a young boy. After leaving school, he was apprenticed to Ingram & Co, a firm of organ builders, in their Edinburgh factory and progressed to become a journeyman. The firm described him as ‘smart, willing and punctual’ and recommended him to future employers. In 1908, Scovell and Company called him ‘a most conscientious and painstaking worker, perfectly steady and reliable and a good all round man’. His reference made it clear that he was leaving the company only due to ‘depression of trade’ and they expressed a hope that he would return at some future date. By this time though Terrot had already married Isabella Younger, a bookbinder from Sunderland. Their elder son, Richard, was born in Hampshire in 1908 but by 1911, they were in Newcastle, where, a year later, their younger son, John was born. We can only guess that while in Heaton and working as an organ builder, Terrot was employed by Blackett and Howden but it seems a fair assumption to make. However, in 1923, the family set sail from Liverpool to New York in search of a better life. Terrot spent the next eight years working for Henry Pilcher’s Sons, an organ builder, in Louisville, Kentucky. He became a naturalised American the following year and spent his career building and installing organs all over the USA. He received and treasured many glowing references, which Grace still has. Terrot and Isabella eventually moved to White Lake, Michigan, where Isabella died in 1954 and Terrot a year later, aged 73 years. Whenever you listen to organ music this Christmas, spare a thought for these Heaton master-craftsmen and the lasting joy they have brought to the world. Researched and written by Chris Jackson, Heaton History Group. Thank you to HHG member, Joyce Lovell, and to George Cottrell for information about Heaton Methodist Church organ; to Pauline Giles for information about St Gabriel’s organ; to Grace Myles for photos and information on Terrot Myles. This entry was posted in Research and tagged Addison Street, Addycombe Terrace, Blackett and Howden, Brough Street, Charles William Howden, churches, Eighth Avenue, Elim Church, Frank Hubbard, Grafton Street, Heaton Bingo, Heaton Congregational Church, Heaton Methodist Church, Heaton Park Road, Langhorn Street, Lord Armstrong, Malcolm Street, Molyneux Street, musician, North View, organ, Rothbury Terrace, Sir Charles Parsons, St Gabriel's, Terrot G Myles, Tosson Terrace, Tynemouth Road, Warton Terrace, William Charlton Blackett on December 5, 2017 by oldheaton. The most obvious missing feature is the tower but if the building also looks a bit short it is because the chancel is missing. The lower building at the south east corner was temporary vestries and the chimney was for the boiler in the cellar. Next time you are passing see if you can still find a chimney. There are no pinnacles on the turrets at the west end. The card was stamped with a Newcastle upon Tyne post mark at 5 pm AU 20 04. It also shows pillars supporting a gate leading to the vicarage. There is a 1901 record that Mr Watson Armstrong, Lord Armstrong’s nephew and heir, kindly gave a site at the west end of the Church for a vicarage. An anonymous donor gave £1,000 towards the cost and a grant was made available from the Ecclesiastical Commissioners of £1,300. The architect, F W Rich, was given instructions to prepare plans. The clergy (vicar and two curates) plus housekeeper (Miss Welch) and maid moved into the new vicarage in May 1903. They had been living at 8 Rothbury Terrace. The new vicarage cost £3,500. “We have been told that people sometimes stay away from church on Sunday evenings because there is some difficulty in getting seats. The Bishop has consented to the North aisle being used before it is actually consecrated. We are glad to find how much more the North aisle has been appreciated; it is indeed a wonderful improvement to the church and it helps to see more of what it will be like when completed. We can now much more readily picture to ourselves how fine the effect will be when the North Transept arch is opened and the chancel added. Clearly building work is progressing and in 1905 we read that the dedication and consecration of the new parts of the church took place on 29 September. This was carried out by the Bishop and included the chancel, organ chamber, north aisle and transept and the porches at a cost of £14,000. It was started on the south side as a result the east side on Heaton Road reads Heaven and Earth are full! This was enough for a lady to write to the vicar and ask “…what is to become of me?” The tower is 99 feet high and some of the lettering is now showing its age. In the parish magazine in July 1909, the Vicar, Churchwardens and Building Fund Committee wrote collectively regarding the inadequacy of the temporary vestries. The erection of permanent vestries were the next portion of the church extension scheme to be built. The new choir vestry would be a room sufficiently to provide for parish meetings, classes etc. This article appears to have had the desired effect as in September 1910 the Archdeacon of Northumberland dedicated new vestries for the Clergy, Churchwardens and Choir as well as two smaller rooms. Various furnishings were also dedicated but more about them another time. This post card has a post mark of 1 Nov 15. The vestries mentioned above have been completed but there is clearly work to be done on the south side of the chancel. This is where the Lady Chapel now stands. It may have remained like this until 1930/31. At the annual meeting in the spring of 1914 the vicar reported that an application for a grant for completion of the church had been declined by the Bishop but that he, the Bishop, would recommend a grant for a Parish Hall with rooms. A grant of £500 was awarded in August 1915 on condition that the congregation found the balance, around £1,250 by June 1916. At this stage the plan was to build on the site of the iron building on Rothbury Terrace, the City Council having indicated that it must be removed by 1917 due to its deteriorating condition. A canteen was opened in the old ‘Iron Building’ from 5.30pm to 9.30pm for soldiers billeted in the parish. The Iron Building was sold in 1919 for £150 having served as a church and parish hall for 30 years. This meant that there was no hall for social events. Lord Armstrong made available an allotment site on Chillingham Road at half its commercial value but it is not until 1923 that the Bishop agreed a free grant of £2,000 and a loan of £1,500. Plans were submitted for a hall to accommodate 500 with other rooms of varying sizes for classes and recreation. The foundation stone was not laid until 6 September 1924. Then there were concerns about the slowness of the work and questions were being asked about what was going on behind the hoardings Chillingham Road/Cartington Terrace corner. Delays were caused by fresh negotiations with the contractors over costs and then a builders’ strike. The building was eventually blessed on 3 December 1925. It was to take until 1930 before the final phase of building work consisting of the South Transept and Lady Chapel was agreed. At this time it was decided to abandon the original plan for a Baptistry. This was to have been in the south west corner beside the porch. You can see the undressed stone on the post card at the beginning of this article. It is still undressed today partly hidden by a bay tree. 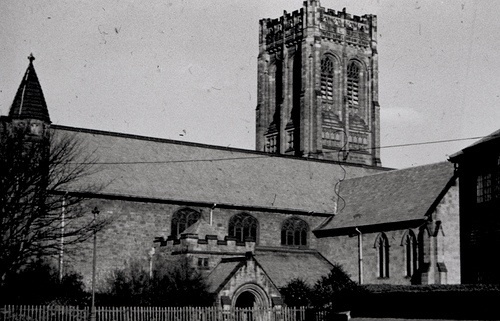 The final building work was completed in 1931 and dedicated by the Bishop on 4 October 1931. He also dedicated many internal features which may be the subject of future articles. This article was written by Heaton History Group member, Robin Long, who will continue with his history of St Gabriel’s in future pieces. Information taken from Chronological History of the Parish Church of St Gabriel, Heaton, Newcastle upon Tyne. Researched by Mrs Joan Brusey (1890 – 1992) and Denis Wardle (1992-1999). Typed by Mrs Jennifer Dobson and Miss Valerie Smith. Bound by Mr John Dobson. Thank you too to Hilary Bray (nee Bates) who gave Heaton History Group permission to digitise and use photographs of Heaton from her postcard collection. Can you add to the story? This entry was posted in Group Activites and tagged Cartington Terrace, Chillingham Road, churches, Frank W Rich, Rothbury Terrace, St Francis's Church, St Gabriel's, William Watson Armstrong on February 8, 2017 by oldheaton. Heaton History Group is often contacted by people who used to live in the neighbourhood and have vivid and usually fond recollections. We love to hear their memories. ‘RS’ still returns to Heaton from time to time. Here is the third instalments of his thoughts. ‘And so I cross the road to the south side of Rothbury Terrace, and continue my westward walk to the parks, now becoming steadily more visible ahead. As I do so, I absent-mindedly reflect on two obvious changes in the demography of this area which, for the sake of convenience, will be referred to as central Heaton. Neither of the changes are regarded here as being necessarily good or bad in themselves, but noticeable and interesting changes they most definitely are. The first is the clear establishment of so much student accommodation in central Heaton, including my own 1960s home on Simonside Terrace (see part 1). I recall none of this at all half a century ago, although I suppose there must have been some, somewhere in this area, even then; however, there was certainly nothing on the scale that there is now. I suspect that the rising student population has been a steadily growing phenomenon over the last few decades, rather than being the result of any single event or cause. But I do know something more definite about the other demographic change that cannot be missed around here. In the early 1960s central Heaton was an overwhelmingly white area, and although the statistic in question was most unlikely to have been 100%, equally probably it was not far off that figure. Certainly, in my first few years at Ravenswood, I can recall no ethnic minority pupils whatsoever. Until things began to change. The oldest boy was called Anjem. He and I soon became good friends. He and his brother were great lads, and thankfully and happily there were no problems of racial tension at Ravenswood – or, as far as I recall, anywhere else in Heaton – of the sort that were being experienced and reported in other parts of the country at that time. As the ’60s progressed and were superseded by the ’70s, an interesting phenomenon could increasingly be observed. The Pakistani-Muslim population of central Heaton began steadily to grow; and the residential focus of this expansion was located here, on this stretch of Rothbury Terrace, between Chillingham Road and Heaton Road. Perhaps initially related to Anjem’s family, but then probably with the establishment of further familial linkages, the population of this particular ethnic minority began to grow, very noticeably decade by decade – albeit fairly gradually on a year to year basis – in this very precise area of central Heaton, before then spreading further afield. But as I approach Heaton Road, on this particular day, there is hardly anyone, of any ethnicity, to be seen; and anyway, there’s no reason to think that the particular demographic change that began to occur here all those years ago would still be in evidence now. After all, people move on and move away: indeed, just like I did. So, finally reaching the junction of Rothbury Terrace and Heaton Road, I look along to my left. Too far to be seen from here, I nevertheless recall Heaton Presbyterian Church (just past the Co-op) where I was a member of the Lifeboys and – when older – the Boys’ Brigade. I remember too, our regular, traffic-stopping Sunday morning parades when, dressed in our navy blue uniforms, and with drums a-beating and bugles a-blowing, we ensured that quiet Sunday morning lie-ins for the late-slumbering residents of the streets on our route became something of a practical impossibility. It’s difficult to imagine that such events still occur today; indeed, on reflection, it’s a bit of a wonder that they were actually allowed even then. And do those local Lifeboys and Boys’ Brigade units still even exist? Maybe not as – the last time I drove past – there certainly wasn’t much left standing of the Presbyterian church itself. Possibly demolished by a team of sleepy, hungover and rather fed up Geordies, still in their pyjamas. Then I turn to my right and gaze in the direction of St. Gabriel’s. This, in fact, was our family church, and where I was confirm … but crikey! What’s that? Across the road, on the other side of Rothbury Terrace. Used to be a doctors’ surgery, back in the day. Clearly it’s something else now; an entirely new building is standing there. It’s the ‘Heaton Mosque and Islamic Centre’. A bit of a surprise. An outpost of Islam … here in Heaton. Of course, if you are a resident of any part of Heaton, but especially of this central area, you probably knew about the existence of this building already; however, you may not have known how or why it came to be located here, of all places, on this corner of Heaton Road and Rothbury Terrace. Perhaps my ramblings have afforded a little insight in that regard. It’s here because when Islam first came to Heaton, all those years ago, it first came to Rothbury Terrace, in the form of Anjem and his family, and all those who came after them. And from that small seed it clearly took root, and flourished. We’d love to hear your memories and see photos of anyone who has lived, studied, worked or played in Heaton. Either leave your comments below the heading of this article or email Chris Jackson, Secretary, Heaton History Group. This entry was posted in Uncategorized and tagged Chillingham Road, churches, Heaton Mosque and Islamic Centre, Heaton Road, Rothbury Terrace, St Gabriel's on December 1, 2015 by oldheaton. 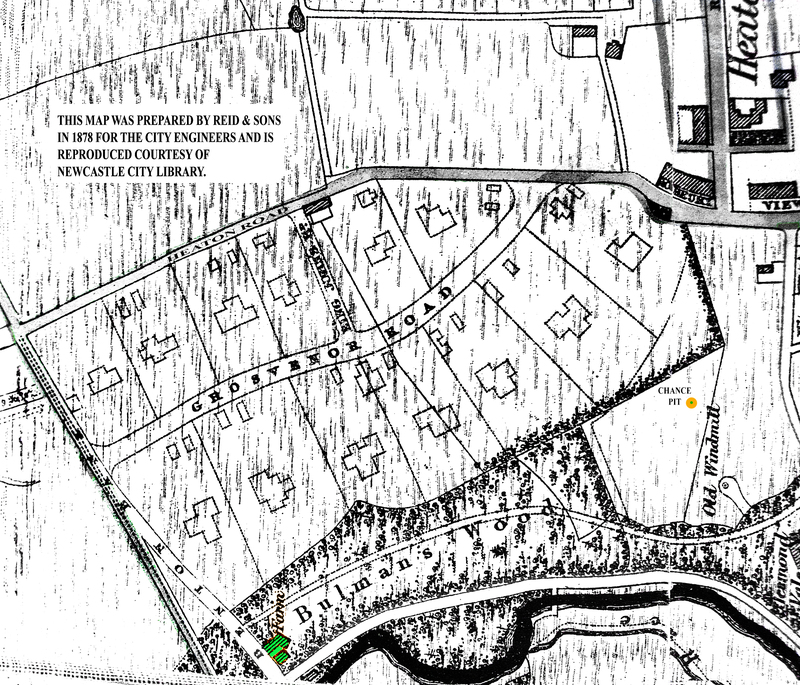 In 1868, while Lord Armstrong was enthusiastically buying Ridley land in Heaton, he acquired a plot north of Heaton Hall as far as Benton Bank: it included areas then known as Bulman’s Wood and Low Heaton Farm (the farmhouse was by the junction of Benton Bank and the Ouseburn Road: see map) plus three abandoned coal mine sites – the Thistle, the Knob and the infamous Chance Pit up by the windmill. This entire plot was bordered along its western edge by the Ouseburn Road, its southern boundary by Jesmond Vale Lane and the eastern side by Heaton Lane (now Road). 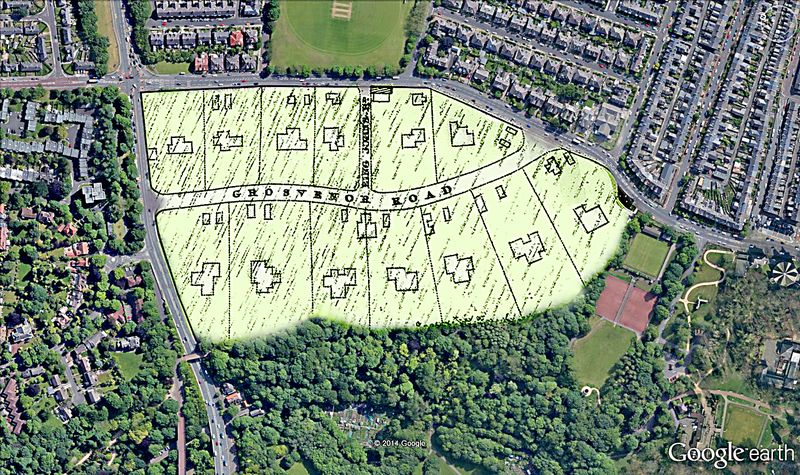 After giving Armstrong Park to the people of Heaton, two new roads were planned through the remainder of the land which had been divided up and offered for sale as thirteen residential plots of between two and four acres each. This extravagant development would be named The Heaton Park Villa Estate: millionaire mansions by the baker’s dozen. There goes the neighbourhood! The following illustration shows the plots in relation to today’s developments. 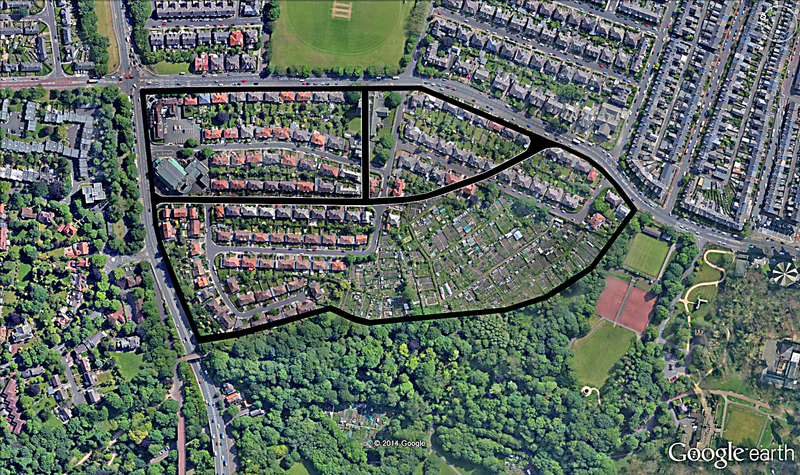 This last illustration indicates how little more than half of the estate was ever developed (more on this is to follow) while the remainder was given over to an allotment complex of two halves: the small northern section called St Gabriel’s Allotments and the larger southern portion known as the Armstrong Allotments. A letter dated 1884 to Sir William from his Newcastle architect Frank W. Rich of Eldon Square (who was later to design St Gabriel’s Church) explains how the original 13 large plots have been abandoned in favour of 41 plots of between one-third and one acre-and-a-half. He indicates that these smaller sizes are what buyers are looking for and that anyone needing more may simply buy multiple plots. One such gentleman for example – Mr Thomas H. Henderson of Framlington Place (behind the Dental Hospital) – asks for a particular 1.5 acre plot at an offered rate of £500 per acre when Sir William is looking for £600. This tells us what a four acre plot would have actually cost and why there were obviously no takers for such sizes, especially when you consider that the largest residential plots anywhere in Newcastle were an acre and a half. The layout for the forty-one plots was never lodged with the planning department and it seems likely that the outlined houses shown on the original thirteen plot plan were simply random or figurative, and that each house would have been designed (hopefully by Mr Rich) to the specifications of the buyer. There were certainly no house designs lodged with the planning department for either the thirteen plot estate or the forty-one plot version. Mr Rich further explains to Sir William that the roads were run by necessity according to the gradient of the land. Looking at the terrain today indicates that the largest sites – those bordering the park – would have been on relatively flat ground down at low level, but with no prospect beyond their own boundaries; while the smaller Heaton Road sites would have occupied the high ground looking out across the park. I don’t think anyone buying a four acre plot down below would have been greatly enamoured of their neighbours in the cheap seats lording it over them; would you? Ever the benefactor to us hoi-polloi, Lord Armstrong’s will said that the entire area be reserved as allotments for those tenants of his Heaton development lacking gardens of their own – which was a lot of them. Sir William’s heir was forced to apply for an act of Parliament in order to overturn the will and develop such areas deemed suitable for construction – but not until the nineteen-twenties when housing shortages had become a government issue. If you own a house in Heaton and have the deeds and other documents and would like to know more about its history, get in touch via chris.jackson@heatonhistorygroup.org and we’ll try to help. If enough people are interested, we might be able to arrange a course in researching your house – and could even help with the research depending on demand. This entry was posted in Research and tagged allotments, architect, Armstrong Allotments, Armstrong Park, Benton Bank, Bulman's Wood, Chance pit, churches, Coal mines, Frank W Rich, Grosvenor Road, Heaton Lane, Heaton Park Villa Estate, Heaton Road, Jesmond Vale Lane, Knob pit, Lord Armstrong, Low Heaton Farm, Ouseburn Road, Ridley family, St Gabriel's, St Gabriel's Allotments, Thistle Pit, William Armstrong, William Watson Armstrong, Windmill on September 24, 2014 by oldheaton. Heaton Windmill We have to kick off with this one. 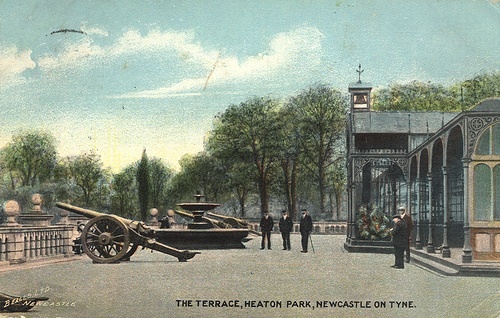 Iconic is an oversused word but this feature of Armstrong Park is certainly a familiar and much-loved landmark and the one we chose to be Heaton History Group’s logo and feature on our home page. 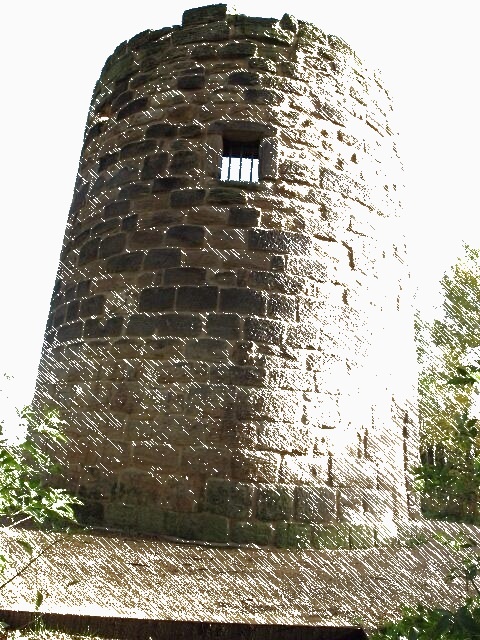 The windmill dates from the early eighteenth century and was already a ruin by 1844. Constructed from coursed squared sandstone, it’s been partially restored since then and is grade 2 listed. Has to be a contender. 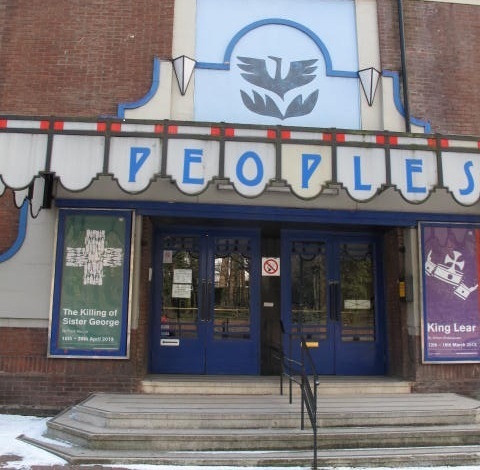 People’s Theatre It’s the art deco detailing together with, for many people, happy memories of time spent inside which makes The People’s such a favourite. 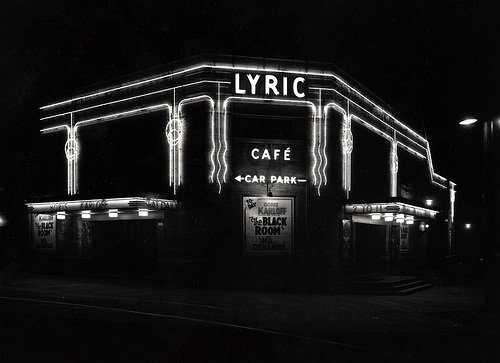 The building was designed by Marshall and Tweedy and opened in 1936 as the Lyric cinema. During its first week, the two films shown were ‘Little Colonel’ with Shirley Temple and ‘Sweet Music’ with Rudy Vallee and Ann Dvorak. (Thanks to Tomorrow’s History for that information). Conversion into a theatre toook place in 1962. The first play performed there was George Bernard Shaw’s ‘ Man and Superman’. (Thanks to People’s Theatre). The photos below were taken in this week’s snow and shortly after the cinema opened in 1936. (Thanks to Newcastle Libraries for this one.) Does it get your vote? Shakespeare House Although it’s in a pleasant, secluded, green corner and, when we checked it out on a snowy day in March, the birds were in full voice, from the front 47 South View West doesn’t look too different from many other houses in Heaton. It’s the gable end that makes it one of many people’s favourite local landmarks. William Shakespeare’s face (based on Martin Droeshout’s famous engraving of 1623) looks down on streets named in his memory. The surrounding terraces – Stratford Grove, Warwick Street, Malcom Street, Bolingbroke Street, Mowbray Street, Hotspur Street etc – were built before the end of the 19th century but when some houses were demolished 100 or so years later to make way for Hotspur School, the decorative brickwork was put in place. 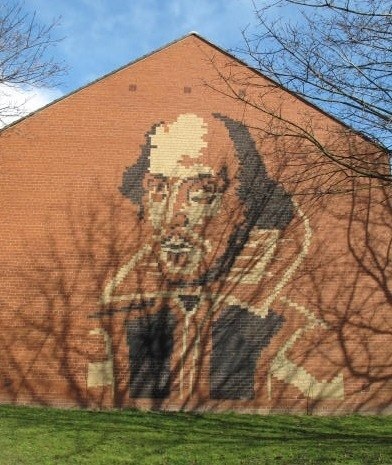 The People’s has been putting on Shakespeare plays in Heaton regularly since the 1960s. The RSC’s been coming to Newcastle since 1977, with members of the company often lodging locally as well as intermittently appearing at the People’s. The South View West gable end seems fitting somehow and it makes us smile. The Wills factory was retro even when it opened in 1950. 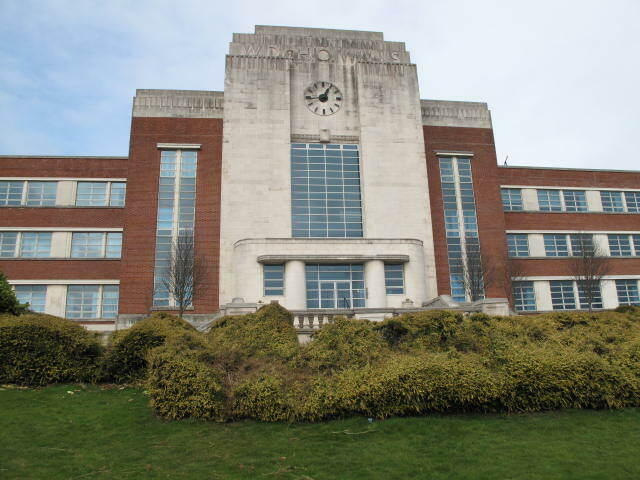 Its foundation stone had been laid four years earlier but it was built to a pre-war art deco design by Cecil Hockin, an Imperial Tobacco Company in-house architect. (WD and HO Wills was actually part of Imperial Tobacco as early as 1901, so even the buidling’s name was retro from the outset.) Apparently at its peak, 6 million Woodbine cigarettes a day were manufactured at the plant. 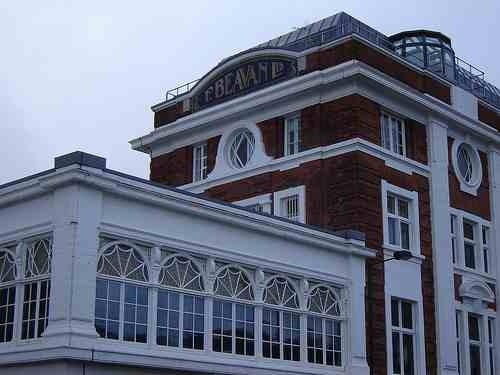 The complex included a theatre and other leisure facilities for staff as well as the factory itself. Production ceased in 1986. Its last days were documented by photographer Isabella Jedrzejczyk and can be seen on the Amber Online website with text by Ellin Hare. The disused building was given Grade 2 listed status to prevent demolition. It stood empty for 10 years until Wimpey Homes converted the former front wing into 114 apartments. The building is still a nationally important example of art deco architecture and its elegance and clean lines, together with its prominent position on the Coast Road, makes it a local favourite too. Luckily it just sneaks into Heaton – the adjacent railway line marks the boundary with Wallsend. If you or anyone you know used to work at the factory, please get in touch. We’d love to find out more about what it was like to work there. King John’s Palace Built before 1267 and so the oldest still (partly!) 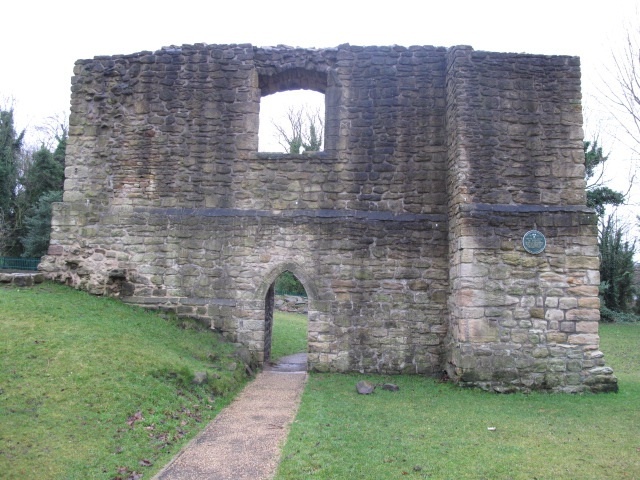 standing building in Heaton by some distance, King John’s Palace is a constant reminder of Heaton’s rich history. Despite its name though, it almost certainly doesn’t date from the reign of King John, which ended in 1216. Best estimates date it around 1255. There are traditions, however, that both King John and King Edward I stayed in Heaton which may have caused confusion. The building’s alternative names of The House of Adam of Jesmond or Adam’s Camera (‘camera’ here means ‘chamber’ or a usually round ‘building’), give better clues to its history. Adam was a knight and staunch supporter of King Henry III. Records show that he became unpopular for embezzlement and extortion and that he applied to Henry for a licence to enclose, fortify and crenellate his house. Adam went to the crusades from which he didn’t return and his house was allowed to fall into disrepair. Thanks to the Jesmond Dene History Trail for the above. Beavan’s Beavans had been trading since the 19th century – an 1879 directory lists ‘Fred Beavan, draper’ on the North side of Shields Road, where Parrishes later traded – but the lovely building on the corner of Heaton Park Road and Shields Road is Edwardian and contains many features, such as the round and stained glass windows, which are typical of the period. A railway line used to pass under the building which apparently meant that permission wasn’t granted to build upper floors on the west side. 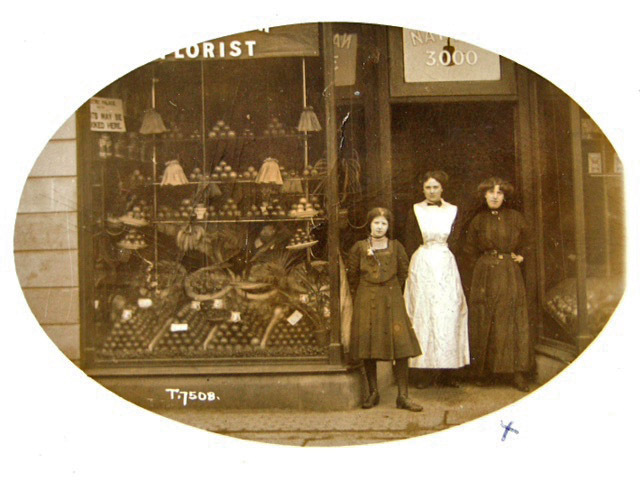 The new store was opened in 1910 and traded until (we think) the early 1990s. You can still see original name plates ‘F Beavan Ltd, Ironmongers and Furnishers’ as well as a sign which reads ‘Beavans – the great cash drapers’. the building now contains apartments. If you or anyone you know used to work at Beavan’s or know more about its history, please get in touch. We’d love to find out more. Ringtons The former head office of the Ringtons tea and cofee business is the first 1920s building on our short list. Its distinctive white stone, green and yellow tiling and the elegance, especially of the slightly older southern half, along with its association with a long-established, local company make it a favourite with many people. It’s now the auction house of Thomas N Miller, with Ringtons operating from more modern premises next door. 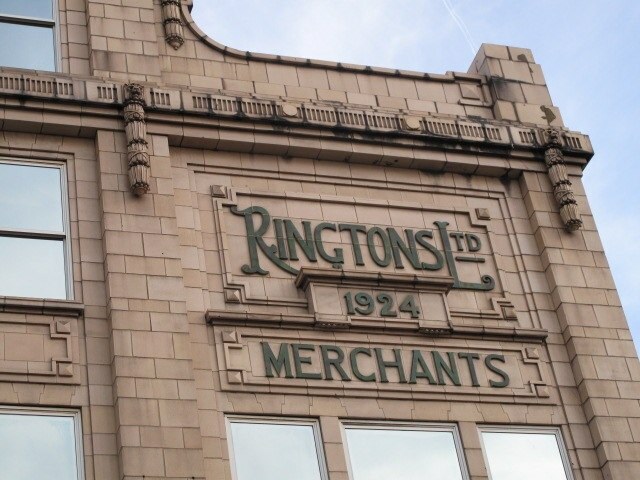 Ringtons was established in Heaton by Sam Smith and his business partner, William Titterington, in 1907, at first delivering tea from small premises in the avenues. Thank you to Ringtons for the older photograph which shows a busy scene from when the firm was using the horse drawn carts which helped make it famous – and notice the long-demolished houses in the background. Can anyone help us date it? Sam Smith and his family later lived Warton Terrace. To find out more about Ringtons and its long association with Heaton, go to the small museum housed in the company’s current Algernon Road HQ which tells the fascinating story of the firm’s history. St Gabriel’s Church The tower of the parish church of St Gabriel is one the tallest structures in Heaton and so the church can be seen from some distance. It’s built in a free Gothic style of snecked sandstone, with a roof of graduated lakeland slate (Thanks to English Heritage for that information). Th e style and materials help it give quite a villagey feel to this part of Heaton and mean that it’s much loved not only by its congregation. The church was designed by FW Rich (also responsible for Ouseburn School and Bolbec Hall) and built in 1899 on land donated by Lord Armstrong. The south transept and chapel were added in 1931. It is now Grade 2 listed. This photograph held by Newcastle City Libraries was taken in 1957/8. Heaton Road Co-operative Building One of several former Co-ops in Heaton, this fine three storey brick building adds character to the southern end of Heaton Road. It was built in 1892 and, as well as the date, carries the inscription ‘Newcastle upon Tyne Cooperative Society Limited, Heaton Road branch, Registered Office 117 Newgate Street’ on decorative white stonework between the first and second floors. 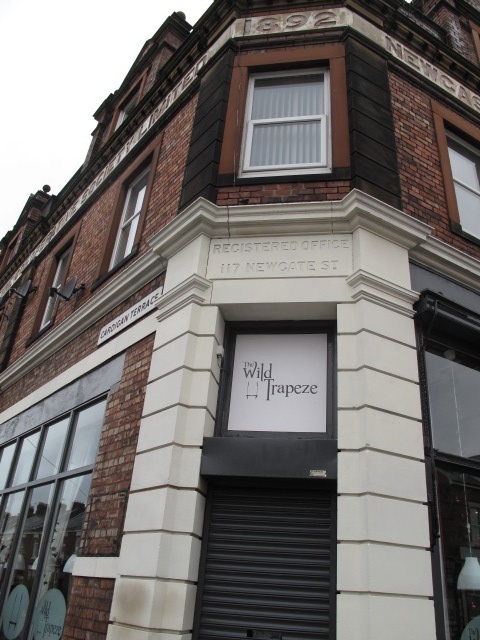 Over recent years, many different businesses have operated from the ground floor but currently the owners of cafe ‘The Wild Trapeze’. florist ‘Hazy Daisy’, ‘Gold Star Gym’ etc are ensuring it’s looking better cared for than for some years. If you could help us find out more about the history of the Co-operative movement in Heaton or have photos or memories of any of the stores, we’d love to hear from you. Chillingham Road School Chillingham Road Primary School (as it now is – there used to be a secondary school on the site too) holds a special place in Heaton’s, and indeed Newcastle’s, history and in the heart of many Heatonians. It’s the oldest still functioning school in Newcastle, with its 120th anniversary celebrations taking place later this year. A sum of £15,130 15s was sanctioned by the Newcastle School Board to build the school which, when it opened in 1893, was considered to offer the most sanitory environment of any educational establishment in the city, with a state of the art ventilation system comparable with the best in Leicester,Liverpool, Glasgow, Nottingham and other cities. The first head was Mr R H Gilhespy, formerly of Arthur’s Hill School. It’s also the school one of our best known historical figures, Jack Common, attended – and we can still read about life in Heaton and at the school just before World War 1 in his autobiographical novel ‘Kiddar’s Luck’. 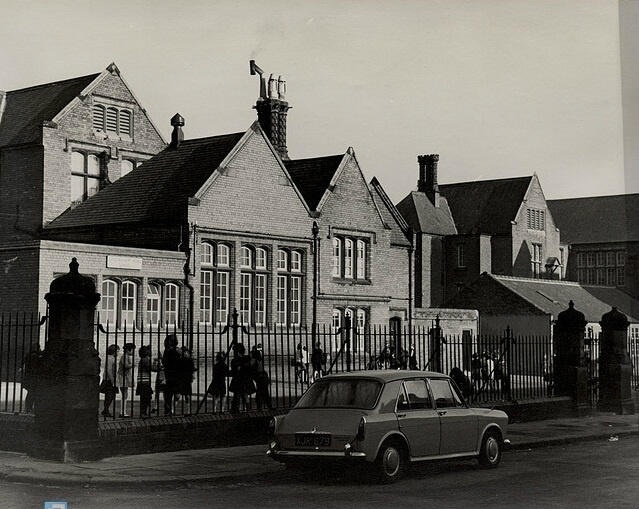 There’ll be a chance to learn more about the history of Chillingham Road Primary School later this year when a programme of events is planned to celebrate its 120th birthday. On Wednesday 23 October Heaton History Group and the school will jointly present a talk about Jack Common by Dr Keith Armstrong. More details to follow. The photograph above dates from 1966 and is held by Local Studies at Newcastle Central Library. Heaton Park Pavilion The original pavilion was erected in 1884 as an aviary housing exotic birds and animals. It looked out over a croquet lawn and, beyond that, a bowling green. You can read what Jack Common said about the pavilion in a previous blog. It was later extended to accommodate a cafe and other facilities. A lot of people think the original building still stands but it was badly damaged by fire in 1979. 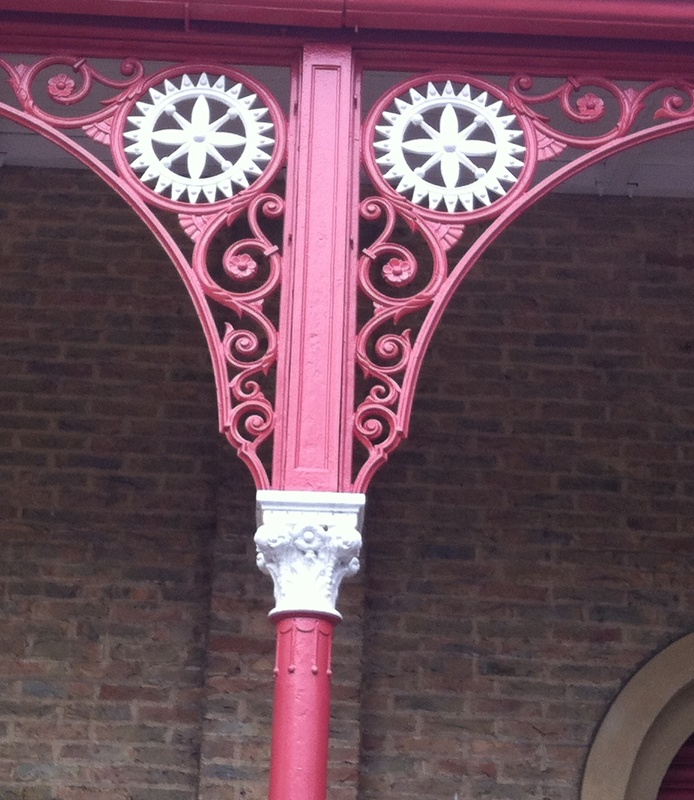 The surviving ironwork was restored at Beamish Museum and, painted in typically Victorian shades of dark red, black, cream and olive, used in a new building, which was made from handmade yellowed bricks. The reconstruction won a Civic Trust award. It is currently occupied by Sambuca, an Italian restaurant. Its history, Victorian elegance and association with carefree summer days in the park combine to make it one of Heaton’s favourite building. Thanks to Heaton History Group Honorary President, Alan Morgan, for the above information. You can read more and see photographs in his book ‘Heaton: from farms to foundries’ or better still come to his illustrated talk on 22 May. Contact chris.jackson@heatonhistorygroup.org to reserve a place. And thanks to Newcastle Libraries for the image of the old postcard, which is undated. High Heaton Library The most modern building on the shortlist and the third library to have been built the site. It was designed by Ryder Architecture Limited (who were also responsible for the City Library) and was commended in the 2009 Public Library Building Awards. its curving façade and intimate scale seem to contributes to its welcoming feel. Click on the third link below to see it looking beautiful by night. Sadly it’s due to close in June this year. Corner House When you see the the Corner House, you know you’re nearly home to Heaton, standing prominently as it does at the corner of Heaton Road and the Coast Road. 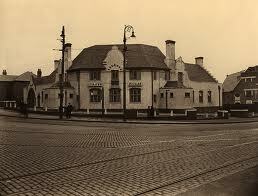 The Corner House was built at the same time as the Lyric cinema (now People’s Theatre). It’s changed quite a bit over the years but, empty roads aside, is still immediately recognisable in this photo taken in 1936 soon after it opened. We especially like the Corner House because it’s where our 2013/4 programme of talks will kick off on April 17th with John Grundy’s Buildings of Heaton. Hadrian’s Wall Ok, this last nomination is a bit contentious. Is it in Heaton? We think so. It forms the southern boundary of our catchment area and would definitely have been considered part of Heaton, when it was an independent township until the early 20th Century. We’re historians. It’s in. Is it a building? Debatable. The accepted definition usually involves some sort of shelter and human occupancy, but there were turrets every 500 metres or so and so we reckon the whole structure was, therefore, one very long building. And a lot of the foundations are still down there – somewhere. At nearly 2000 years old, it’s by far the oldest structure in Heaton, the most popular tourist destination in Northern England and the only World Heritage Site on our list so it’s got to be in the running. You can follow the line of it marked out by studs on the south side of Shields Road. And also we wanted an excuse to mention that we’ve just booked Paul Bidwell OBE, Head of Archaeology at Tyne and Wear Museums and expert on Roman archaeology, to give a talk later in our 2013/4 programme. Watch this space! We had to stop there, although we realise that there were other contenders, many of which we’ll feature on this website over the coming months. Thank you to everyone who voted and congratulations to FW Rich, architect, and everyone associated with the church! This entry was posted in Group Activites and tagged Armstrong Park, Beavans, Chillingham Road School, churches, Co-op, Hadrian's Wall, Heaton Park, Jack Common, King Johns Palace, Library, Lyric cinema, People's Theatre, Ringtons, Shakespeare, South View West, St Gabriel's, Warton Terrace, Wills Building, Windmill on March 9, 2013 by oldheaton.